Olive O3HD review | What Hi-Fi? Whatever their allure, most music servers are complex and expensive. 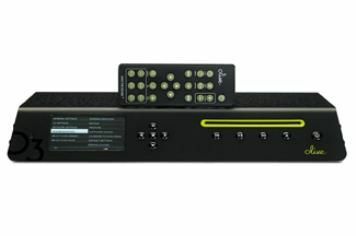 Olive's O3HD, by contrast, is designed as a modern music server for a less well-heeled audience. In fact, at £900, it's priced to rub shoulders with many mainstream CD players. The O3HD has a 500GB hard-disk and an integrated CD drive; it's self-contained, and doesn't require connection to a computer. Clearly, you can buy music servers (and PCs) with larger hard drives, but Olive argues that this isn't a music server aimed at music hoarders, but music lovers. It's specifically designed to be plug-and-play simple: there's an Ethernet port, but it's also preloaded with a 2.7-million-strong CD database to provide suitable artist, title and track information whenever you load a disc. The touchscreen control interface is a delight, both in its simplicity and the speed of its response. Olive wrote its own control software to deliver the best user experience, and it shows. The standard remote is, by contrast, plain and utilitarian – although an iPhone/Touch app is also available. Build quality is fine, if not as lavish as the pricier Olive O4HD. The spec's fine too, with Ethernet, a rear USB for connection to a suitable hard-disk for backing up your music, and preloaded internet radio access. The original model lacked a digital output to upgrade its sound quality with an external DAC, but now that's been rectified and a digital out (via USB) is fitted as standard. While it sounds perfectly fine, it's not quite as rhythmically adept as we'd like. However, now that you can add a good DAC, the problem is easily corrected. It's smooth, listenable, able to focus musical elements within a broad and engaging soundstage and reasonably detailed. A dedicated CD player, such as the Marantz CD6003, will sound better, but obviously doesn't have the functionality of a full media server. The O3HD can perform feats that would elude both the Marantz and many a dearer CD player, and it's delightful to use. Now that it's endowed with that digital output, it's an even more competitive product and deserves five stars.